You can setup Unsubscribe Feedback Form inside the email campaign and email template of Aritic PinPoint. This form is used to collect the feedback from the subscribers/ contacts who want to unsubscribe from the email segment or email campaigns. This is an optional feature to use when creating an email template or email campaign based on segment. This Unsubscribe Feedback Form will get automatically appended to that specific email’s “Unsubscribe” link; when the email gets delivered to the subscriber. To Setup Unsubscribe Feedback Form, first create an Aritic PinPoint “Standalone Form” from Assets section, adding the fields for data you want to capture from the unsubscriber. 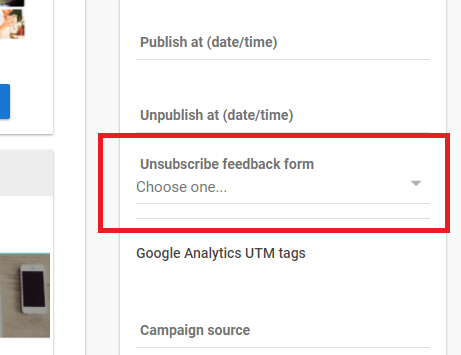 Next, select the form you created from the drop-down menu on the right side under “Unsubscribe feedback form” of email campaign and email template setting. Using this unsubscribe form will allow you to capture specific information from your contacts when they unsubscribe.